In our Read-On STARTALK program, K-16 teachers of Chinese tackle the issue of character and text literacy development among learners of Chinese as a foreign language (CFL). 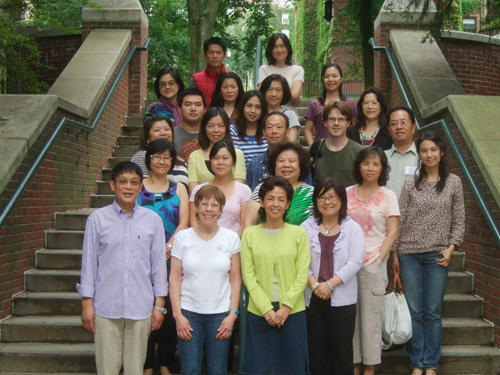 For 10 days, participants gather at the College of the Holy Cross in Worcester, Massachusetts to work with top researchers on literacy and second language acquisition and with each other, to identify a set of best practices in teaching Chinese characters and approaches to literacy in Chinese. They work in grade-level teams to develop teaching modules that incorporate character and text literacy instruction and practice. The final products, thematic units differentiated by grade level (Immersion through College), following the National Standards in Foreign Language Teaching (the “Standards”), are presented in this website by year. Collaboration across grade levels to develop research-informed best practices in character and text literacy instruction for CFL learners. Promotion of cooperation and articulation across grade levels. Development of Standards-based, student-centered, thematic units that incorporate character and text literacy instruction and practice at each of the four grade levels. Dissemination of these instructional units through websites hosted by professional organizations and educational institutions. Character acquisition is the foundation for Chinese literacy development and should be an integral part of a Standards-based curriculum for K-16. Reading skills in Chinese are enhanced by the explicit instruction of reading strategies. The Chinese literacy curriculum should target lower-level and higher-level reading processes at all levels of instruction. Reading expands our understanding of the world, its people, and ourselves. Successful readers have the skills to access, analyze and apply the content of texts to enrich their lives. Read-On V (2016) : Text Literacy – Character acquisition is the foundation for Chinese literacy development and should be an integral part of a Standards-based curriculum for K-16. Read-On VI (2017) : Text Literacy – Reading literacy, including the ability to identify and evaluate the information in a text and the viewpoint and motivation of its author, is essential for the full participation of individuals in society.